In graduate school at Stanford University, I had about ten different ideas of things I wanted to do, and one of them was to look at the link structure of the web. My advisor, Terry Winograd, picked that one out and said, "Well, that one seems like a really good idea." So I give him credit for that. Nine years after starting at NCR, I moved to a head-office job in Dayton in 1988. An NCR executive was giving a presentation; he had great slides and an even better delivery. The CEO, Chuck Exley, listened to the entire presentation in his typically gracious, courteous manner. At the conclusion, he nodded and said something brief but profound: "Good story, but it's hard to look smart with bad numbers." And as I reflected on it, the presenter, articulate as he was, as good as his slides were, simply had bad numbers. That comment has always stayed with me. You have to focus on the underlying substance. There's just no way to disguise poor performance. I've tried to follow that advice throughout my career. Deliver good numbers and you earn the right for people to listen to you. My father was an absolutely wonderful human being. From him I learned to always assume positive intent. Whatever anybody says or does, assume positive intent. You will be amazed at how your whole approach to a person or problem becomes very different. When you assume negative intent, you're angry. If you take away that anger and assume positive intent, you will be amazed. Your emotional quotient goes up because you are no longer almost random in your response. You don't get defensive. You don't scream. You are trying to understand and listen because at your basic core you are saying, "Maybe they are saying something to me that I'm not hearing." So "assume positive intent" has been a huge piece of advice for me. In business, sometimes in the heat of the moment, people say things. You can either misconstrue what they're saying and assume they are trying to put you down, or you can say, "Wait a minute. Let me really get behind what they are saying to understand whether they're reacting because they're hurt, upset, confused, or they don't understand what it is I've asked them to do." If you react from a negative perspective - because you didn't like the way they reacted - then it just becomes two negatives fighting each other. But when you assume positive intent, I think often what happens is the other person says, "Hey, wait a minute, maybe I'm wrong in reacting the way I do because this person is really making an effort." Some of the best advice I ever received was unspoken. Over the course of my IBM career I've observed many CEOs, heads of state, and others in positions of great authority. I've noticed that some of the most effective leaders don't make themselves the center of attention. They are respectful. They listen. This is an appealing personal quality, but it's also an effective leadership attribute. Their selflessness makes the people around them comfortable. People open up, speak up, contribute. They give those leaders their very best. When it comes to specific advice, the best was from a former boss, who told me, "Don't view your career as a linear progression." He advised me to take horizontal rather than vertical steps: to try out situations that are unstructured, to learn different ways of working, and to get outside of headquarters and experience different cultures. I've applied this advice many times - most notably, taking a decidedly unstructured job at IBM Japan and then joining the fledgling IBM services business. After those experiences, I had the confidence that I could manage pretty much anything. One of my managers, and a great mentor, June Delano, gave me this piece of advice on decision making: When faced with a tough decision, do the right thing. Always ask yourself, "If I do this, and a reporter published a story about it the next day, how would it read?". Would I be proud or ashamed? Would I be able to justify my decision and the consequences? How about you - what's the best or worst advice you've ever received? Hi Dan - I have just discovered your blog and just wanted to say that it really hits the mark for me - thanks. Welcome, and thanks for that advice. Keep dreaming! Great piece! As you may have seen, I wrote a piece about "Women Leaders I Admire" [http://ninasimosko.com/blog/2008/04/09/women-leaders-i-admire/] in which I wrote about Indra Nooyi and a slight personal connection to her. Anyway, these are good pieces of advice. Thanks for this post. It was a very insightful one and I picked up lots of good advice from reading this. I've always told myself to just do whatever it is that makes me happy so I won't have any regrets in life..well, just as long as I don't break the law or hurt someone, I guess that's fine. Thanks, yes, I do, where you wrote, "what are also very notable characteristics about Ms. Nooyi are her uncanny humility and her willingness to be open about what she is good at and what she is not good at. This skill – knowing what you don’t know – is, in my opinion, one of the greatest qualities of highly successful people and one which I completely admire in Indra Nooyi." I don't remember who gave me this advice, but as an HR pro I always ask myself how I would sound explaining my (or the company's) actions in court. "Well, you see Judge..."
Thanks, that works for me too! Ask questions - preferably open ended that get people talking and thinking. Meet everyone - when you're new to a team, make it a point to meet with your new colleagues ASAP. Previous tip, ask questions, is key. Take notes - helps your remember and enables you to see the patterns. Don't give up - learned this from my last boss. If you leave the field, you can't win. Really like your blog Dan. So much so that I've linked to it from mine. Keep up the great posts! Thanks for the additional advice and for the link. I’ve subscribed to yours and added you to my blogroll as well. 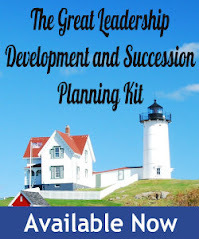 You may have also noticed your book, The Next Level, is listed on my sidebar as one of my favorite leadership development books. In fact, I’d say it’s the best book I’ve ever read on leadership presence and executive transition. I’ve given copies to newly promoted executives and they in turn have passed it along to others.